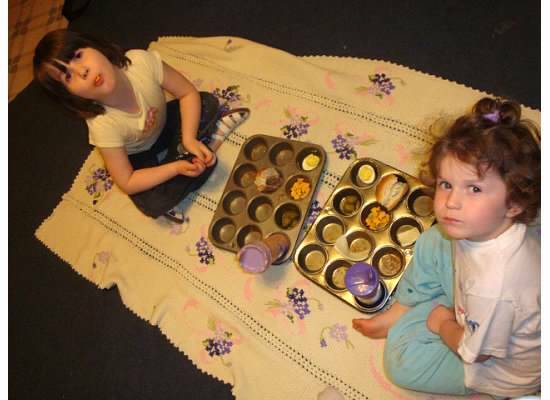 Moments of Mommyhood: Muffin Tin Monday Goes AWOL! Here are the girls enjoying their "picnic"! What a freaking cute/fun idea!! Once I am feeling better I am SO going to do this!! Thanks for sharing!! FUN!! my mom use to make muffin tin lunches for us...she was so ahead of the times. What an adorable idea!!! I going over to check out more. So cute! I love doing picnics in the living room w/ the kids I nanny for! picnics inside are the best! Glad to have you back! YUM!!!! What an awesome lunch!!! I'd love to do that with my kiddos but I have a feeling it would be a huge mess! I'll have to give it a few years and then try! This post has me craving deviled eggs now! how fun. I so need to try this picnic thing. Your picnic looks fun. I love that muffin tin idea. I just LOVE that you had a picnic indoors! VERY cute!!!! This is a brilliant idea. I am going to steal if that is ok for my little girl. Happy Sits day. Your blog is wonderful. Exspecally my 4 year old who cant stand his food to touch..
how fun! happy SITS day! That is the greatest idea ever! I'm now following your other blog. I'm going to read more about it tomorrow after some sleep! This is such a fun idea! My grandkids would love it! 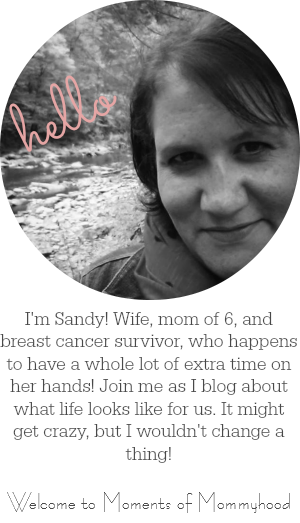 And I didn't know you had another blog...off to check it out! Happy SITS Day - enjoy it! Holy crap! What a GREAT idea! And so simple too. I love it and can't wait to try it. Thanks Sandy! Love love the muffin in picnic! And happy SITS day! Mmm, those nummies look yummy!! I LOVE this idea!!! Happy SITS day! That muffin tin idea is super cute! Happy SITS day! love the muffin tin idea! Okay, that's just brilliant! I'll so be doing this with my 2 year old twins! Happy SITS Day!!! Glad I found you through SITS! What a fun idea! Anything to get my kids to eat! I think this is SUCH a cool idea! I can't wait to have kids...I really think kids love to eat with cool ideas like this. My parents used to let us have a "restaurant" every once in a while...we'd make up a menu with special things, like chocolate milk and lemonade, and let each kid/parent "order"...I remember it to this day! Everything tastes better when it's made by someone else! :) Stopping in from SITS. Have a great day! Love the muffin tin lunch! We bought a big separated plate the size of a placemat at Pottery Barn once - wish I could find one more. They're sooooo very handy for little kids that don't like food to touch! What a great, fun idea! What a cute idea!!! Love it. What a great lunch!! Great idea take Muffin Tin AWOL to another blog. Just stopping in from SITS to say Hiya! If you need something sweet just stop on by my blog and see what we are cooking up! This week's theme was fun! I've been seeing all the hamburgers and wishing I had done that! That is the cutest idea I have ever seen! I have to use that when I have kids! Oh my goodness! So cute! Love this idea~ I lose my mind with three kids (does it count that they are all boys?) How do you do it with 5?!?! Visiting from SITS! Congrats on your day!!! WOW! I was going to leave a comment but by time I finished scrolling down passing all the millions of comments I forgot what I was going to say!!! I've never seen so many comments on a Muffin Tin Monday Post! this is such a cool idea! I wish I would have known about it when my kids were little! Now I will just have to try and remember to do it when my baby grand daughters are old enough! How adorable!!! You are such a fantastic Mom!!!! !